Today, we are interviewing one of our Flipper University students, Stacy Gallego. She is rocking her side hustle and has made over $10K in sales since July! She dives into how got started, busted through some road blocks and how gaining confidence in shipping large items dramatically helped her side hustle! 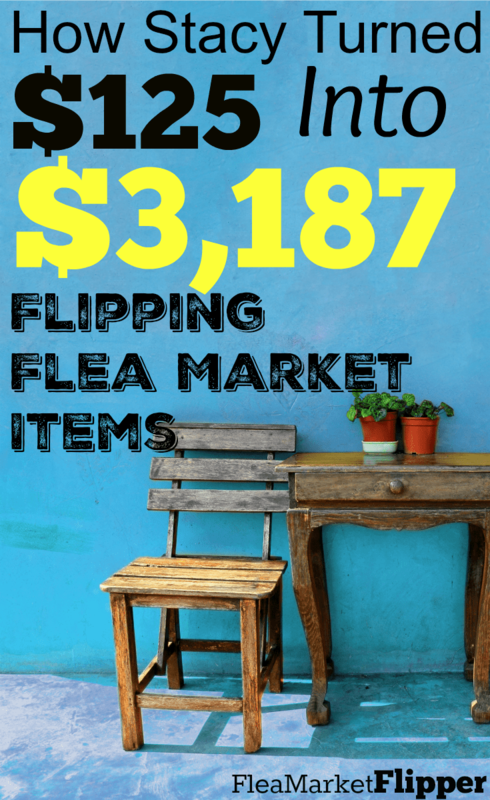 If you are new to Flea Market Flipper, we welcome you! We are happy you are here to learn the ins and outs of flipping for a profit! 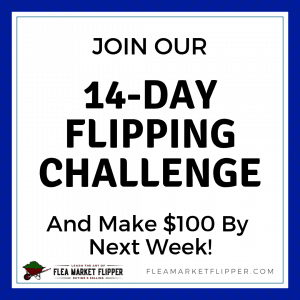 If you have been following us for any length of time, you know that we are passionate about helping people learn how to make great money flipping items either as a side hustle or a full-time job like me and Melissa. 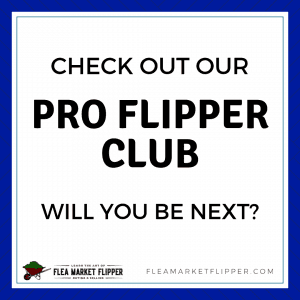 In 2015, we started Flipper University to help others grow their flipping income substantially. It is what we love to do and we get energized by seeing the success of our students who have taken our course. Hey guys! Thanks for asking me to share my story with you. I am happily married to my husband, John for almost 14 years. We have six kids all together and they are our joy. We live here in Tucson, Arizona where I am an RN at a local hospital. For as long as I can remember, I have always been good at making money from nothing. I always had side hustles going even as a kid. I believe that’s just how God designed me. I have always been good at creating ways to earn extra money outside of my budget. Growing up, my dad was an artificial inseminator of dairy cows for over 35 years. I would often ride with him in the summer months to stop along the dirt roads to pick up the aluminum cans to cash in for money. It was a small way I could earn some spending money. I also would work on local farms picking rocks and milking cows. I even got a craft idea one time and made it with another friend of mine. We went door to door and sold a whole bunch of them for a profit! To this day, my kids tease me that I always have an idea brewing and some side hustle cooking on the back burner! Even though I was great with side hustles from early on, my finances were another thing. In 2000 my world pretty much fell apart. I divorced my husband of 3 years with 18-month-old twins. I never had a clue that my finances were so terrible until the bill collectors started coming to my door. It was the most stressful time in my life. I had lost everything in one week. I got evicted from my apartment, lost my car, my job, and I did not have one penny to my name. My parents made me an offer I couldn’t refuse. They moved me and my two little boys to live with them in Wisconsin until I could get back on my feet. That’s where I made a promise to God that if He got me out of my financial mess, I’d never do it again! That was when I started on my journey to be financially healthy. When I married my husband, he was of the same mindset. Together John and I paid our $247K mortgage off in 6 years, leaving us completely debt free in 2016. 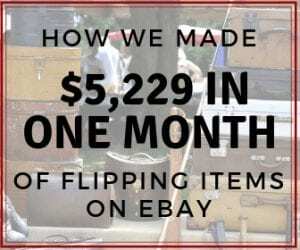 One of the ways I brought in extra income during that time was flipping on eBay. I tell my friends I only “played” with my eBay hustle during that time, not knowing I could actually make a huge income. How did you Find us here at Flea Market Flipper? It’s kind of a miracle I actually found you. Since going through financial disaster in 2000 and learning many financial lessons and in 2016, became completely debt free! We don’t finance anything – nothing! That’s just a way of life for us. We are of the mindset that if we can’t save for it, then we don’t get it. This year, in December, my husband John will be retiring from the Federal Government after 35 years of service. It’s pretty exciting because being debt free we’ve been given so many options…like buying an RV and living in it for the summers! I never had an RV on my radar, even though my husband had one and sold it so we could pay for our wedding! John has always wanted to get another RV and then it happened. Then I walked into one! I realized it would be very easy for me to live in an RV and travel the US. There are so many places that we want to see right here in our own country! In May, I started brewing ideas on how I might be able to get $20K to buy an RV. We came to realize there were enough great RVs without spending a ton, so we decided $20K would be a reasonable amount to get something that worked great for our family. The problem? We didn’t have $20K and believe me, I was already looking at RVs. We decided that if it was possible for us to save the money, we could buy the RV for cash. Now I just needed to figure out how to get the cash to go buy it! I brainstormed and prayed. I thought maybe I could just work like a crazy person picking up extra shifts at the hospital. After all, I had done that the year before when we were saving to take a family trip to Europe. I worked for 6 months straight picking up shifts and we paid cash to backpack Europe for two and a half weeks with our two daughters. We had an amazing time strolling through Spain, Italy, and France. I knew I could do that again easily, but I realized it had stolen a lot of time away from my family. This time I asked God, “How could I work smarter, not harder?” I signed up for Wag, a dog walking service figuring I would drag my girls along with me. Everybody needs exercise, right? I never walked one dog because after doing the calculations, I’d have to walk dogs for 10 years! I thought about serving papers for the courts, but decided getting shot by a disgruntled husband receiving divorce papers was not an option! I continued asking God and trusted He would show me what I was supposed to do. Then I saw it – one of your videos was posted on Fitnancials blog. I was on break at work and I promised myself I’d go back and look at it when work was done. Unfortunately, I could not for the life of me find the post! I panicked and sent a message to Michelle, at Making Sense of Cents, asking if she could help me find it. She directed me to the post and there it was. I remember sitting there after I watched the whole thing thinking, “This is it! I know what I’m going to do.” The rest is what they call history! What hurdles did you jump over to get started with flipping larger items? Honestly, I was so sure this was what I was supposed to do, it didn’t even register with me that he said no! At this point, I had never sent a large item using UPS or Fedex ever (except when I had a return item where they just send me the label to stick on the box). So larger items were completely new and scary territory for me. I decided to just start with large enough items to get comfortable with Fedex and UPS and then I would go from there. 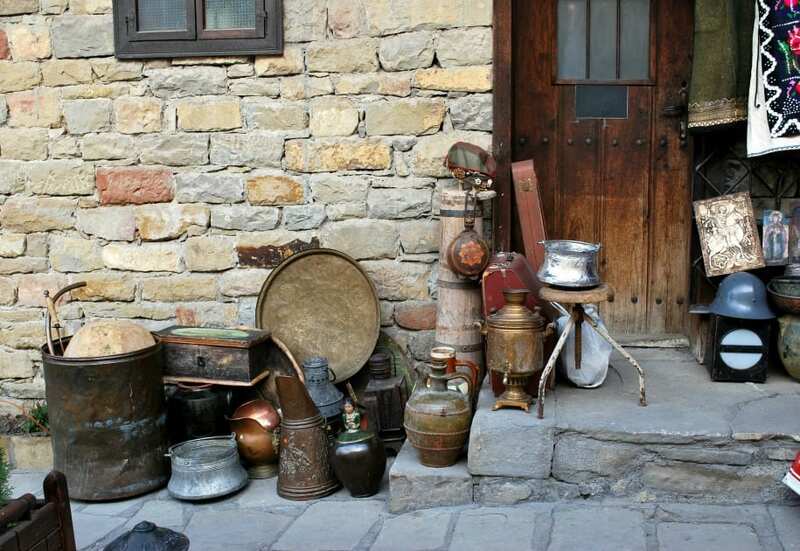 Almost right away, I found some pretty large, profitable items and sold them quickly. It didn’t take long for my husband to take notice and start asking questions. I bought several items for $50 and flipped them for $400 almost immediately. He went from not wanting to do it to saying my eBay flipping gig was kind of cool! Within a month of taking Flipper U, I sold my first freight item that I purchased for $125 and sold for $3,187. My husband has been amazing and extremely supportive of the idea since and has helped me box and ship several large things including my first freight shipment. 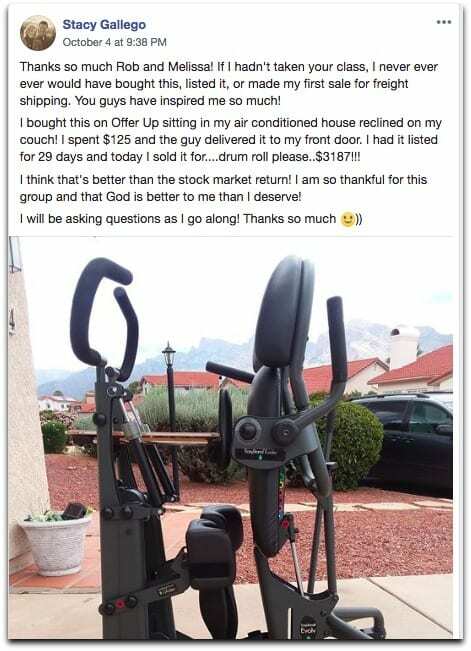 You mentioned in our private coaching group how you were scared to death to get started shipping large items. How did you overcome your fear and graduate to freight shipping? It’s an interesting phenomenon to be sure of something, but it’s quite another to actually do it! 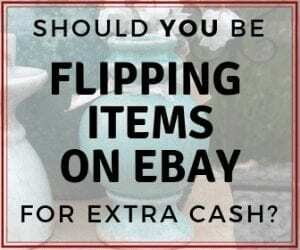 I was absolutely sure that flipping larger items on eBay was the way I was going to make money for my RV, but there was the fear I had to overcome to accomplish it. I am the type of person who really relies on my husband a lot for fixing stuff and figuring things out. I've never really been challenged in that area, because he's so good at it and he takes care of everything. In July when I told John I was going to freight ship and he wasn’t that happy about it, I made an internal decision. I decided somehow, some way I would figure out how to ship large items even if I didn’t have his help. Normally, I would ask John to do the fixing and boxing and all of the things that were challenging and hard. But because he verbalized he wasn't onboard with my whole flipping gig, it forced me to do so many things by myself. I watched YouTube videos for the first time and tested my items. I packaged and shipped large boxes… I mean large like I couldn’t lift them! These were items I never in a million years would have sold or even bought for that matter. All of these things were very scary for me to do. After each scary thing, I would say to myself, “Wow, God you really came through!” There were and are times when I'm so scared I feel like I can't start. Then I start packaging the item and God gives me wisdom and I find myself going to Fedex to drop it off. Forcing myself to do these scary things for a purpose has really grown me as a person. I have a lot more confidence and know now if I can get it on a pallet, I can ship it! I also know you and Melissa are just a phone call away, which decreases my fear significantly! The really awesome thing is, John has completely changed his mind about it. Now, I hear him saying things like, “Your flipping gig is kind of cool” and “We can ship that freight.” We now get to work together, along with our other flipping friends, Lorraine and Ted, to flip large items which has turned into a great source of income for our family. What advice would you give someone wanting to get started flipping for a profit? First of all, I would say, take Flipper U. For me, because I was trying to save money, I didn’t want to spend it. I jumped into this thing being uneducated. As a nurse, I know being educated in my field is essential and saves lives. I also have two college students who are paying almost $500 a credit at the local college with no guarantees they will find good paying jobs. Even though I came to realize the class was less than one credit hour at the college, I still struggled with spending money. Because of that, I didn’t take the class right away and looking back, it was a big mistake and really hurt my profits. I lost opportunities to flip items and I lost money on shipping items properly. When I purchased the first few items that were large, I listed them right away. And then I prayed – prayed that they wouldn’t sell! I really did. I knew the item was going to sell and make profit, but I didn’t know the ins and outs of shipping large items. That was the moment I realized praying my items won’t sell isn’t good for business! That day, I invested in myself and in the knowledge of Flipper U. As I walked through the steps of Flipper U Freight Shipping course, I went from praying my items wouldn’t sell to knowing I could sell anything – big or small. That month I doubled my sales and the next month I doubled them again. Not only that, I am involved in the Flipper U coaching group and have learned so much from them. Most of the items that I sell these days are ideas I get from the other members of the group. They aren’t just a group, but have become family. I can ask questions and know they will help me find a solution. It’s the best investment I have ever made, both in time and financially. In Jul 2018, I started with $0.50 and to date have made over $10K in sales. The money I invested in Flipper U I made back 25 times and I’m not done yet! How close are you to reaching your RV goal? Ahhhh, the RV. Yes, we are making progress and are almost half way there! I have $9,500 of our $20,000 goal and I still have quite a bit of inventory that could sell at any moment. I have in the past not met goals that I have been trying to shoot for. This time, my girls and I made a goal board for the RV. We originally started at $30K, but because we are so frugal, we decided to stick around $20K. We feel we could find a nice RV at this price that would work well for our family. This has really made an impact on our girls. At first, they would joke at the small progress I was making on our RV goal board. But now they can see we are moving up to the $20K mark and fast. Flipping for profit has taught my daughters that if they want something, they can work for it and accomplish it. Our RV goal board gives us vision to see how far we’ve come and where we headed! We believe by the summer, we should have met our goal and hopefully we will be driving around in an awesome paid-for RV. 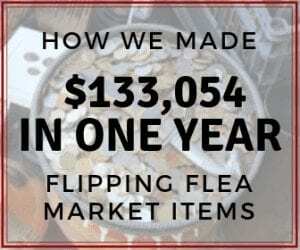 Flipper University and the priceless coaching I have received from Flea Market Flipper has given us the opportunity to meet our hefty goal! We are thankful for all you have done for us! Happy flipping! 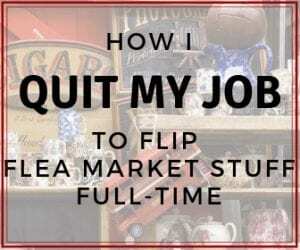 Do you have the desire to make a good side hustle income with flipping items? Check out Flipper University to get started TODAY!